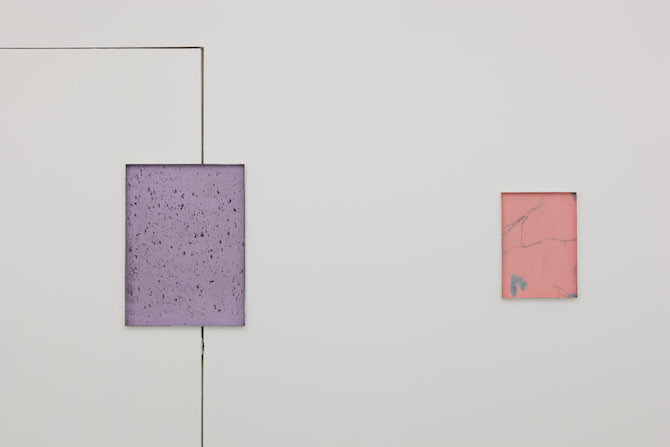 Anna-Lena Werner: Ian, in your paintings you perform several steps – from removing and re-integrating elements – in order to reach the result that you are looking for. How would you describe this process? 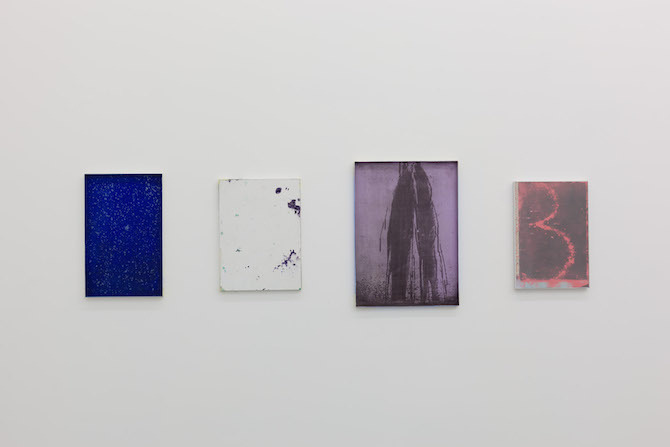 Ian Homerston: The process can start from something as casual as examining how two materials will react together – for example, most of the recent work I have made is essentially based in seeing how paint and photographic emulsion can be combined. Things tend to get worked out on the surfaces from there. Anna: Is every detail of your works planned in advanced or do you tolerate accidents and coincidences as well? 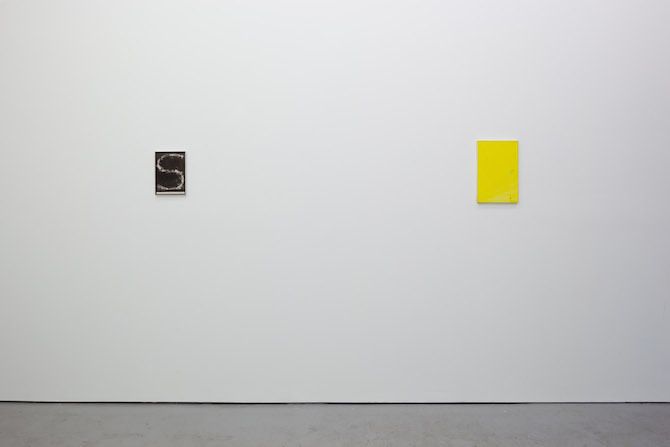 Ian: Accidents and coincidences are present in the work in a sense. Using certain materials in ways they are not necessarily intended to be used means the results can be inconsistent and unpredictable - but then incorporating this, or at least being aware that it is going to happen, becomes part of the planning too. Anna: Your materials include cardboard, plaster, dust and rainwater. Is there a specific reason why you employ a sense of materiality that is inconspicuous rather than glamorous? 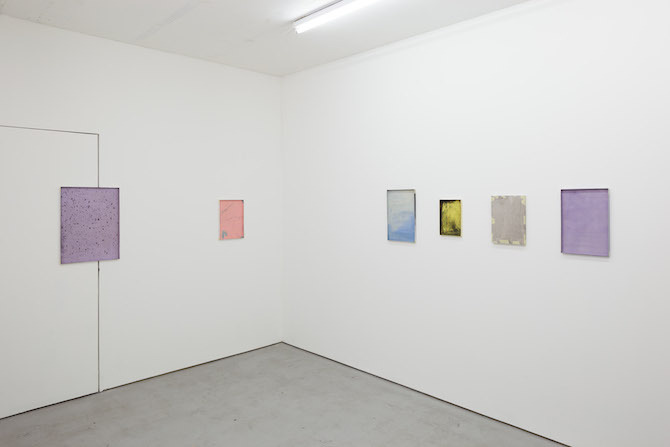 Ian: Most of the works I have made are paintings on canvas. Recently I have been more interested in seeing how the processes in these works could be opened out, and one way of doing this was to get rid of the uniform support. Having done that, I suppose it felt instinctive to use other things that were near to hand in the studio, such as cardboard and plasterboard. These have a malleability that is different to canvas. Because it is not a strong material, plasterboard can be cut, carved into, ground up, and reassembled fairly easily. The plaster dust that is created through doing this then becomes something to be used in the work as well. Dust and rain are interesting things to use because although they’re completely prosaic in one sense, they are also ephemeral and transitory, which perhaps imbues them with other connotations. I suppose I found there was enough to explore in these materials for now, rather than looking to introduce anything more glamorous as you put it. 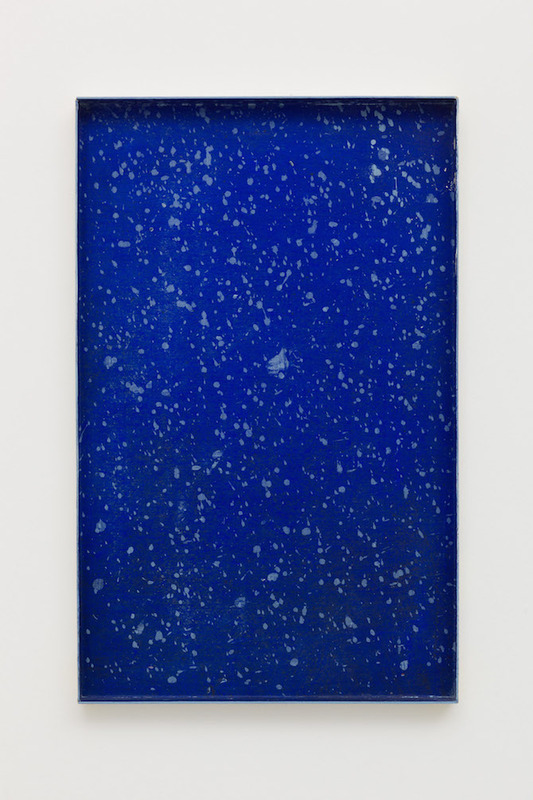 Anna: Your paintings very much refer to the method and the practice of painting itself. Why is this self-referentiality such a dominant part of your work and how does it influence your approach? 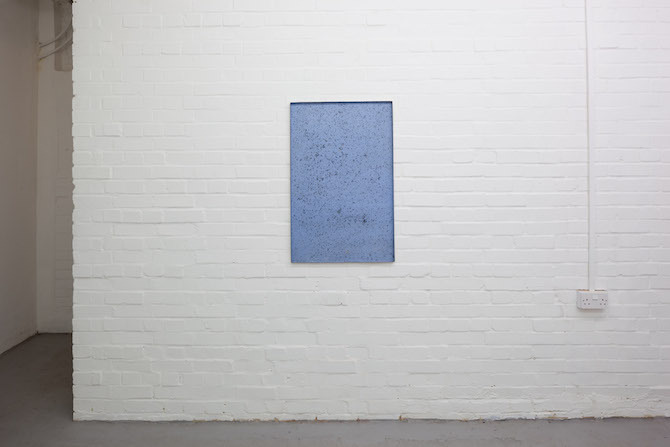 Ian: Yes, this is important, although I think any element of self-reflexivity is perhaps centred less specifically on the practice of painting in the recent works. 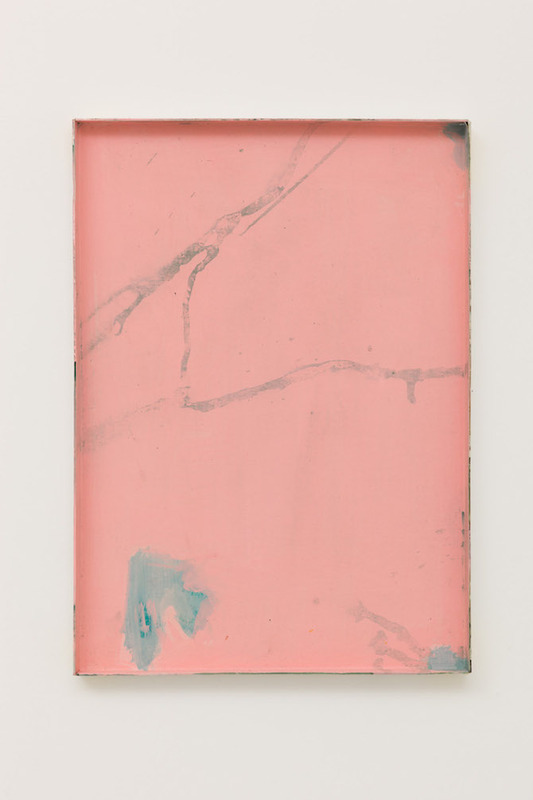 They are still very much rooted in painting, but some of the newer pieces don’t actually involve much paint, and I am less preoccupied with abstract painting tropes now than has been the case previously. 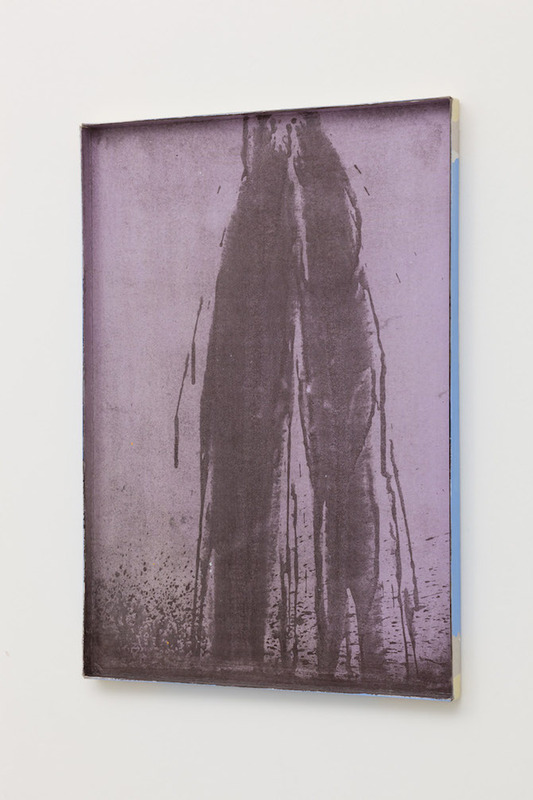 The use of a photographic medium means the works have become more like photograms, even though they don’t seem particularly photographic in their appearance. 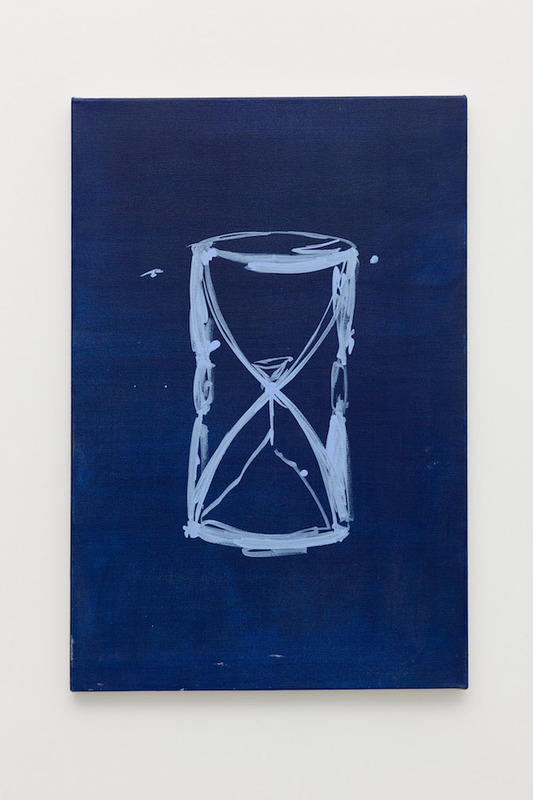 Introducing this element also brought the idea of temporality to the surface – the time involved in making the works became more significant because they required certain exposure periods, and the fact they were light-sensitive meant the surfaces began to pick up traces of what they encountered in a sort of indexical sense. So I think the process of construction has become more complex, but remains visible in a way that perhaps offers more for the viewer as well. Anna: Do you enjoy the act of painting? Ian: Yes, there is enjoyment in there somewhere. Anna: A striking feature of your work is the choice and combination of colour. How do you select these colour-compositions? Ian: I suppose what I said before – about two things reacting together – applies to the way I use colour as well. Most of the works tend to use a combination of just two colours. Using photographic emulsion has been restrictive in the sense that only darker colours – blues, greens, purples - seem to ‘work’ with the medium, so to an extent that is something that has determined what colours I use. 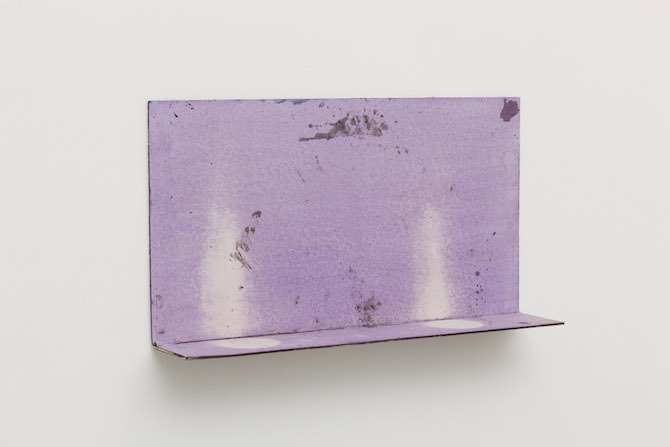 Anna: Some of your works exhibited in your current show “Whereas” at Cole Gallery in London exceed the traditional painterly format with small interventions: The small purple painting looks like a shelf, one is installed onto a door’s frame, many others are framed by a thin layer of cardboard. What is your opinion on traditional display and exhibition formats? 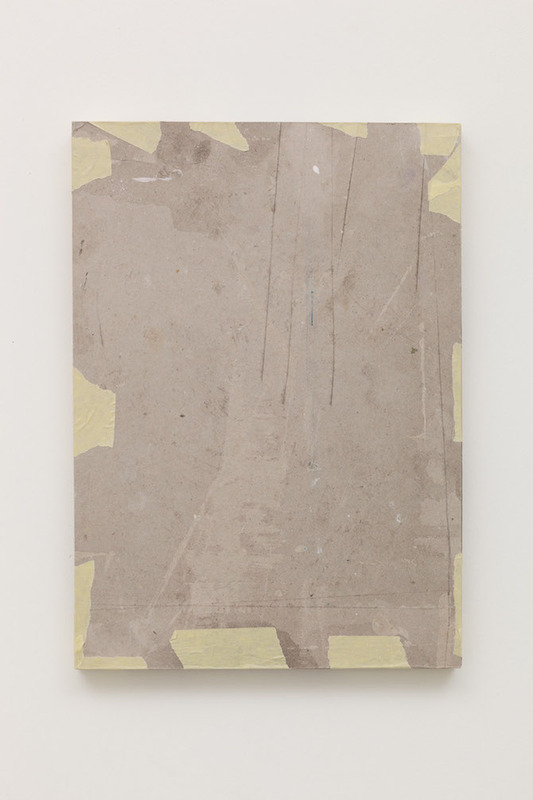 Ian: The cardboard pieces were given this boxlike, receptacle form in order to contain what was being applied to them – water, dust, etc. It also means they imply a conventional painting support inverted. This suggests a reversibility of surface and a concern with front and back and depth that I think has always run through the work, but is maybe made more physical in these pieces. 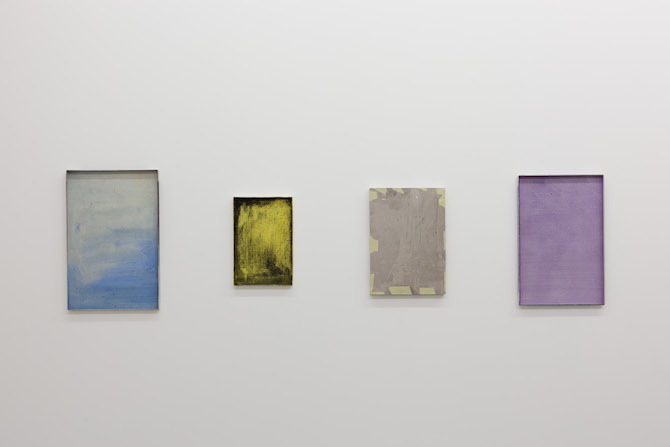 (Some of these works were also displayed the other way around, so that they have a more typical painting form.) The piece that was installed across the door and wall was really a way to deal with the particularities of the space at Cole. 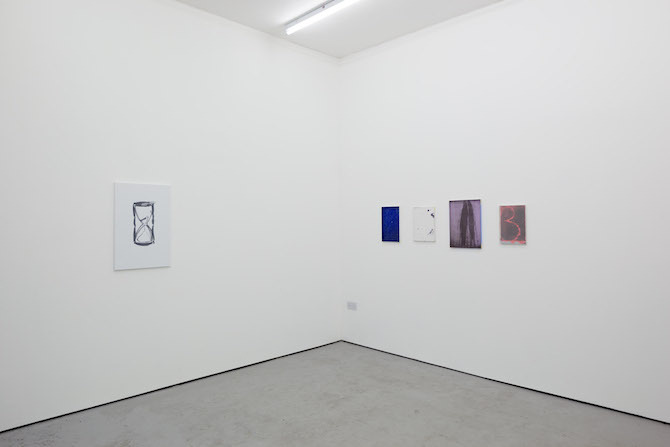 The gallery’s basement space has three doors which feel quite conspicuous, and acting as if they weren’t there wasn’t really an option, so hanging something across the door rather than around it seemed like a straightforward, if perhaps unexpected, solution. Anna: A few works from the show incorporate a figurative motif. Two of them show an hourglass. Why do they have such a unique feature? 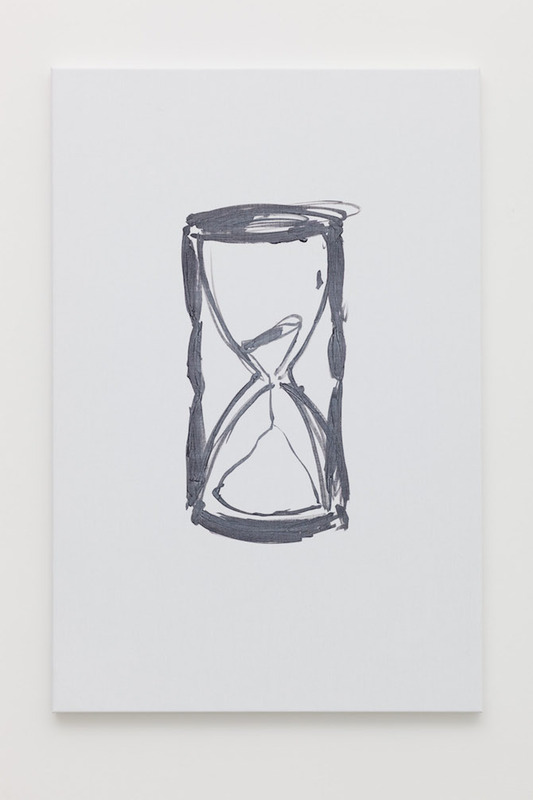 Ian: When I painted the hourglass I was thinking of the idea of temporality in the other works. So really it acts as a symbol in the context of the show. I also wanted to include something that might undermine the other pieces - if they were viewed casually - being regarded solely as modest, abstract paintings, so putting something figurative and comparatively bold in amongst the other work was one way of doing this. Anna: You grew up in Cornwall, which belongs to the most magnificent countrysides in the UK. Does your home’s nature influence your aesthetic production and perception in any way? Ian: Yes, I grew up there. The landscape probably did have quite a strong impact on me, although it doesn’t feel like a direct influence on the work. Anna: If you wouldn’t be an artist, what would be your occupation? Ian: I don’t know, probably not a writer though.